Red Diamond Jewelry is a jewelry store located in the Imperial City Market District. It is found across the street from A Fighting Chance and the Black Horse Courier and next to The Feed Bag. Red Diamond Jewelry is divided into three areas: Red Diamond Jewelry, Red Diamond Jewelry Private Quarters and Red Diamond Jewelry Basement. The main trading room is located on the ground floor and is sparsely arranged with locked display cases and counters against all the walls. Carpets are meticulously arranged on both floors and walls and the lit torches give the shop a warm and relaxing glow. The front door opens to the sight of the first display case, which holds three amulets: a jade amulet, a bronze amulet and a copper amulet. There's also a jade necklace and the rare highwayman's shirt. Following the wall, the next display case contains four necklaces: Two bronze, one silver and one copper necklace. Also on display is a brass ring and a brass pearl ring. Right next to the door is a locked display case, which can only be unlocked using Hamlof's key. It contains the rare blue silk shirt, a jeweled necklace and a jeweled amulet. To the right of the case, at the bottom of the stairs, is Hamlof's small dining arrangement set up. On the table sits copies of Gods and Worship, Beggar Prince and a Guide to the Imperial City. Along the stairs, there are four counters with very hard locks. They all hold leveled, respawning jewelry: each of the counters will contain one or two pieces of leveled jewelry (75% chance for the second item), although it will never be enchanted. On top of the counters, more clothing and jewelry: Five bronze necklaces and one jade necklace as well as a green silk garment, a red velvet garment along with blue suede and gold trimmed shoes, one of each pair. In the back of the room is the counter where Hamlof offers his services, and on top of that, another key-only display case, which contains a jeweled necklace and a silver necklace. There are also six rings; two brass topaz, two gold emerald, one brass pearl and one jade ruby. There is also a lectern on the desk, which holds random clutter and doesn't respawn. The private quarters consist of a single room with a small dinner table, a double bed and a writing desk as well as several barrels, crates and sacks. The dinner table is right in front of the door and holds a bread loaf, a cheese wedge, a piece of ham and three potatoes. 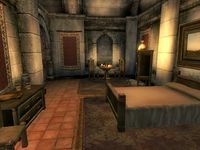 For drinking, there's two bottles of beer and, discreetly placed in the midst of all the food, three bottles of skooma. Near the chair, there's a cupboard with more food as well as four sacks. Three of them contain food and the last one ordinary clutter. In the western corner, the desk reveals assorted writing materials, and so does the shelves opposite the bed. On top of the shelves, there's a belted vest and on the floor a pair of clogs. In the northern alcove, there's a cupboard with drinks as well as an open sack with food and two closed sacks with clutter. The barrel holds even more clutter, as does the lower crate. The upper crate contains clothing. All sacks located there can be used as safe containers. Halfway down the stairs, on the landing, sits a barrel with a chance of a repair hammer and a sack (the first safe container you meet in the basement) with a fair chance of some gold and/or a lockpick. In the basement area, along the wall, there's a crate with clutter and on top of it, near some lit candles and a barrel, a gold amulet and a brass ring. The barrel contains clutter and another chance for a repair hammer. Behind the crate, there's a sack with a small amount of gold, which also provides safe items storage. In the northwestern corner, some shelves hold more clutter and a small crate with clothing. The crate in the southwestern corner holds even more clutter while the unlocked chest has a good chance of jewelry and silverware. This chest doesn't respawn as well as the next one; following the wall, another unlocked chest holds two or three pieces of leveled equipment. Right next to the stairs, a barrel holds clutter, while the nearby shelves holds two flawed diamonds and one flawed emerald. 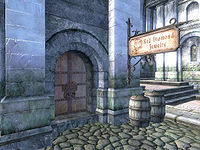 The store was probably originally meant to be for horses rather than jewelry, an idea presumably dropped because in Oblivion horses are not supposed to go inside walled cities. The shop's initial name was "The Bit and Bridle", a name which is still used for the associated faction and the associated key. The key is carried by Hamlof and opens both the front door and the two display cases inside the store. 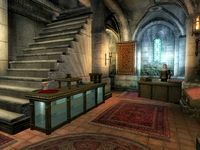 The faction is shared by Hamlof and Ris Fralmoton, an ostler who was presumably the original shopkeeper. The unique Spectre Ring was set to be purchasable here, but it is owned by the non-implemented NPC, Ris Fralmoton. Ris was to be a horse merchant, so presumably the ring should have been set to belong to Hamlof. As such it does not appear in Hamlof's stock. 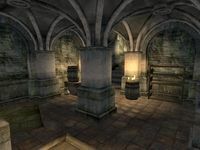 This issue has been addressed by version 1.0.0 of the Unofficial Oblivion Patch; it sets the ownership of the ring to Hamlof.